LOCATION. LOCATION. LOCATION. Draw back the curtains and take it all in. Lush Amish farmland, cows grazing in a nearby pasture, and a one-room schoolhouse on the horizon. 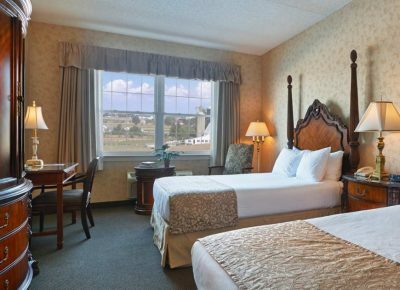 You’ve just awakened in the heart of Lancaster’s Amish Country at AmishView Inn & Suites, winner of TripAdvisor’s Hall of Fame Award, and rated the Number One Lancaster hotel by Tripadvisor. AmishView is also rated the Number One 3-star in the NATION by Trivago. Located on Lancaster County’s only AAA Cultural Scenic Byway and surrounded by Amish farms, AmishView provides the intimate atmosphere of a bed & breakfast with the amenities of an upscale Lancaster, PA hotel. From extra fluffy bath towels to Lancaster’s best complimentary breakfast buffet, our goal is to make each one of our guests feel special.